Paper plant can use commercial wood pulp, commodity paper, waste paper as raw materials to produce high strength corrugated cardboard, corrugated paper roll, etc. Leizhan delivers the complete corrugated cardboard production line for waste paper recycling system. 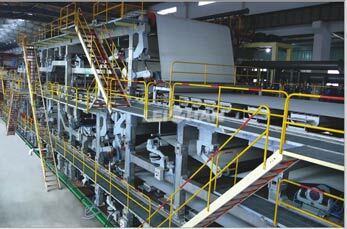 It contains two sections: paper pulping system and corrugated cardboard making system. Corrugated cardboard making machine contains the following components: headbox, wire section, press section, drying section, gas hood section, sizing section, calender, reeling machine, etc.